The tough start to the season continued for the Slough Jets when they hosted the Manchester Phoenix as the opener to a home and away weekend. It was the visitors who opened the scoring when at 7.01 Liam Chong netted from Andy McKinney and Richard Bentham after offering two powerplay opportunities. 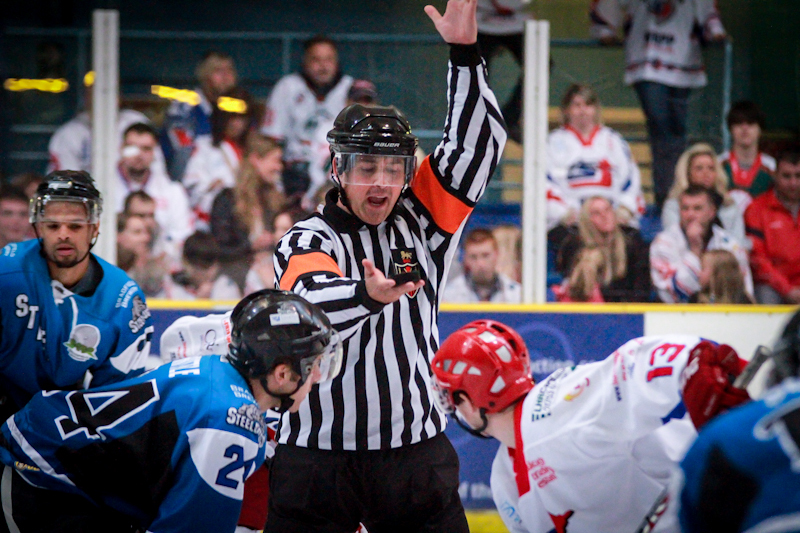 Slough ended the opening period penalty killing when Darius Pliskauskas sat out a slashing minor. Ciaran Long finished off a delayed penalty chance at 26.44 to level the game thanks to assists from Slava Koulikov and Mindy Kieras but at 34.02 Chong netted for a second time making it 1-2 and it was with the same score line that the period ended. Two quick goals in the final period clinched the win for the visitors, the first at 42.01 from Richard Bentham and the second an unassisted strike from Tony Hand at 44.48 making it 1-4. Slough used their time-out with 9.45 left to play and when Manchester picked up an icing infraction penalty giving away a 5 on 3 advantage they also used theirs at 52.52. Darius Pliskauskas scored the home team’s second goal with 4.54 left to play but despite pressuring the visitors could add no further to the scoring. 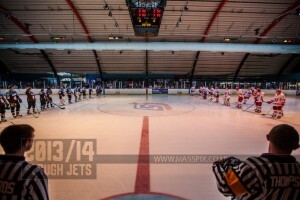 Slough Jets started their weekend on Friday night with a journey to Swindon Link Centre to take on the Wildcats. The visitors were on the scoreboard first thanks to Darius Pliskauskas converting a powerplay opportunity at 6.08 and just over 2 minutes later Frantisek Bakrlik had made it 0-2 with his even strength goal. A goal from Michal Kapicka at 12.42 made little impact to the score when at 13.42 Matt Towalski scored Slough’s third. The second period saw only a goal each, Towalski stepping up at 31.06 with his second of the night and Aaron Nell scoring for the home team with 2.53 left in the period ending the middle frame 2-4. Slough got back underway in the third period when Bakrlik made his second strike of the night at 43.01 and Josh Bruce scored at 44.20 making it 2-6. Nell scored at 46.43 for Swindon’s third of the night but Ladislav Harabin made the final strike of the night at 58.15 to make it 2-7. Matt Towalski grabbed the only goal of the first period at 11.01 after Slough had killed the only penalty of the period ensuring a clear 1-0 lead for the home team at the first interval. Adam Greener made his second trip to the penalty box early in the second but it was on Slough’s first powerplay that Mindy Kieras scored his first of the night making it 2-0. Patrick Greene scored for Telford at 27.45 before another powerplay was converted by Kieras for a 3-1 score. At 32.19 Kieras converted another powerplay for his hat-trick and made it 4-1 before the home team killed off more penalty time. Slough’s Frantisek Bakrlik was awarded a penalty shot at 46.54 which he duly converted through the five hole to make it 5-1 and at 51.17 Danny Milton took to the ice to replace Gregg Rockman between the pipes for Slough. With the game won Telford snuck a couple of late consolation goals to add a respectability to their score through James Preece at 59.27 and Greene at 59.47. 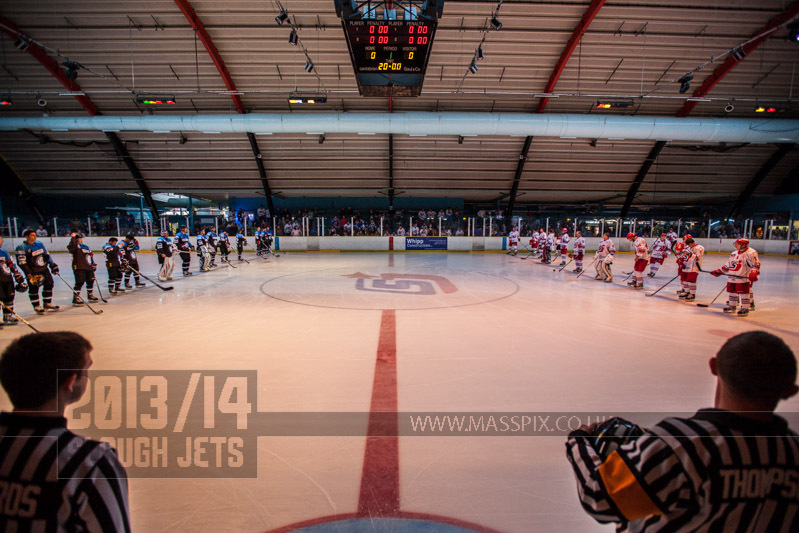 After pre-season Slough Jets faced tough opponents straight off when Manchester Phoenix travelled down to the Hangar for the first points of the season. Slough were put on the back front straight off when Manchester scored shorthanded at 9.04 through Martin Cingel and then the same player scored a powerplay goal at 13.24. Tom Duggan netted the visitors’ third at 14.39 and Doug Sheppard called the home team timeout at the same time. Stephen Wallace scored next for Manchester at 16.19 and the first period ended 0-4. Slough came out and played a better game in the second period, not only upping their shot count but also improving the quality of their scoring chances. Darius Pliskauskas made it 1-4 at 22.13 with a powerplay goal for Slough and Gregg Rockman made some good saves to prevent the visitors extending their lead. The home team intensity upped further in the third period and a swift start from Tom Carlon saw the margin reduced by a goal at 41.59. Midway through the final period Mindy Kieras let lose from the blue line and beat Stephen Fone to make it 3-4. 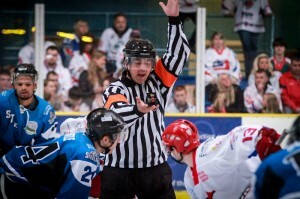 Slough pressured Manchester and Tony Hand called his time-out at 55.39. As time ticked away Rockman left the net at 59.03 in favour of the extra attacker but Juraj Faith scored at 59.26 into the opening net to bury Slough’s comeback hopes. After a successful pre-season Slough Jets welcome Sheffield to start the league and cup season against the newly named Steeldogs. Slough’s depth advantage helped them to a clinical first period lead. Both netminders made some good saves and it take a Doug Sheppard strike at 9.59 to open the scoring. Bowns was still in good form at the other end and kept Slough out until Darius Pliskauskas scored at 17.27. Slava Koulikov picked up the game’s first penalty at 18.06 but Sheppard broke away shorthanded just 12 seconds into killing the penalty and made it 3-0. The home team enjoyed double the shots of their opponents in the second period but failed to find the back of the net but at the other end Tom Squires had managed to squeeze the puck past Gregg Rockman for the only time in the game at 21.29. Sheffield then failed to capitalise on two powerplay opportunities and Slough failed to use one and as the remaining time ticked out the period the teams took the interval with the home team 3-1 ahead. Slough again dominated the final period and decided the game with Adam Greener scoring Slough’s fourth goal at 49.07. The home team killed a 5 on 3 penalty and Scott Spearing and Peter Vaisanen exchanged markers ending the game in the penalty box but Slough ran out comfortable winners. Referee: N Bonniface. Linesmen: A Lack & L Becker. Slough Jets opened their season proper with a visit from local rivals Bracknell Bees in a league and cup match. An open start by both teams to the opening period saw lots of shots with Carl Ambler in the Bracknell net forced into make a few saves before Zoran Kozic opened the scoring at 14.17. Despite the huge 20-7 shot difference just the single goal was scored in the first period. The second period saw Slough set out their stall and take control of the game. Dan Davies netted just 1.13 in and Michael Bowman scored unassisted at 21.55 to make it 3-0. Kozic scored for a second time at 25.31 making it 4-0 and despite both teams taking penalties the visitors could not find a way to find the back of the net. The third period was all one way traffic as Slough continued to dominate. Kozic netted his hat-trick goal at 40.27 and Captain Blaz Emersic scored at 41.11. At 6-0 Adam Marashi took over in the visitors and not even Kozic and Ryan Watt coming together at 44.44 could spark the visitors to score. James Knight scored at 49.05 followed by Davies for a second time and Kozic for a fourth time to complete the scoring and Greg Rockman completed his first shut-out for the Slough in his first game.